World of Tanks is an online multiplayer shooter with a delicate tactics system underneath the action surface. 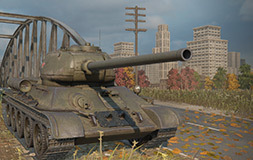 From the Belarusian developers of Wargaming.net comes a third person tank shooting spectacle that not only serves for brute destruction, but also rewards players for acting deliberately and for over watching the situation on the battlefield. In the beginning of a match the player can choose from different classes of tanks. Everyone's play style should be covered as there are options available. The light class serves as a mobile scouting unit with very little chance to fight back, the medium class is the typical point defender and attacker and the heavy units hit very hard and can take a lot of fire. World of Tanks is not only a great tank game, it can also score with some cleverly designed battle maps. The team should be prepared for every map, because they demand planning and adjusting the units wisely to not come short on a different battlefield. Every team consists of 15 players and the important factor for a win lays in pre-arrangements. Typical videogames set in war times feature the player running around as a nameless footsoldier. Not so World of Tanks: as per the name, you are captain of a tank that lays waste to the battlefield and that challenges the best in the world in a competitive league. The betting providers are already filling their forms with new bets. Because World of Tanks, released in 2010, is an exciting multiplayer tactic shooter with refreshing play style. And a lot of betting providers are providing esports-bets for the underdog in the shooter universe. For sure, if it comes down to offered bets World of Tanks is neither a League of Legends nor a Counter Strike. But the growing interest in esports-betting also thrives with the tank tactic shooter and so a lot of platforms on the internet have adopted betting on World of Tanks teams. There is a multitude of sites available, check here for a more in-depth look at the reputable esports betting sites. The most popular ones are the winner or loser bets. And the odds are varying here. It should always be considered which teams are clashing against each other. Two very different teams in the sense of experience and skill will lower the odds of the favorite and raise the odds for the inexperienced team. If you have got two teams, for example in the World of Tanks finals, which are nearly equal, the odds may even out on a lower rate. Mostly these odds range from 1,90 to 2,50 and that's not a bad value. Since 2013 the Wargaming.net League is the biggest esports event for World of Tanks enthusiasts. First taking place in Europe, the tournament took the world by storm and is now represented in numerous countries, such as North America, Asia-Pacific and the CIS. They all got their own league, but it all comes down to the big finals in the Wargaming.net League. Warsaw in Poland was the last venue and the league could come up with a price pool of 350.000 USD. But be sure, the tournament will be back – and it's getting bigger and better with every year.